The very best fitness tracker with a Bluetooth earpiece in it that you can buy. Not really recommendable on any other level, especially given that it's the same price as a Microsoft Band and far pricier than a Fitbit Charge HR. It's a fitness tracker with a Bluetooth earpiece in it! Who wants a fitness tracker with a Bluetooth earpiece in it? "Hey! Do you know what would be really, like, super useful? If you could pop your fitness tracker out of its strap and use it as a Bluetooth headset to take a call," said no one ever. Welcome, then, to the weird world of the Huawei TalkBand B2, a wearable that's also a Bluetooth headset. It arrives with an air expectation unparalleled outside of a sequel to Battlefield Earth. What I'm saying is, the original TalkBand B1 was possibly the worst wearable ever. So expectations are not stellar. 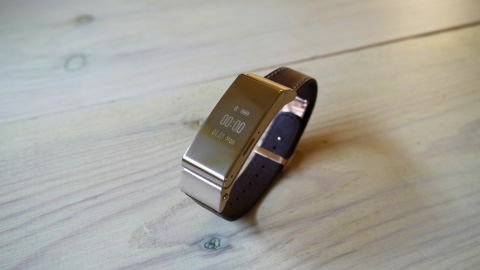 Pop it out of the mostly pleasing packaging and the TalkBand comes 90% charged. Huawei estimates that a full juice-up will deliver six days of calorie snooping, but I found it lasted for about four days of reasonably energetic use. This will be less, obviously, if you use the strange Bluetooth headset. The screen is a 0.73-inch, 128 x 88 pixel, mono PMOLED touchscreen, so prod the single side button, and sweep a finger over it to cycle through running distance, sleep time, fuel burned and steps, alongside a generic time/battery charge/date main display. It's mono, but clear as a bell and readable even in glaring sunlight. The band slides through a loop and pops into a catch under your wrist, and once clicked in place feels light, comfortable and unthreatening. The standard, TPU plastic strap is a snug, comfy wrist-wrapper (though leather straps are available), and the unit weighs a pleasingly light 30.6g. The only branding is a subtle company logo on the clasp. Overall, it walks a fine line between stylish wearable and a basic wristwatch you'd be inclined to donate to a charity shop. Inside, a 6-axis motion sensor automatically tracks steps, and this is pretty much on the button, sometimes veering towards understatement. If you want to track runs, though, you need to tell it with a three-second press on the running menu screen. Again, results varied by up to two minutes of running time compared to other fitness trackers. And that's it. It's slim pickings on the sports front. You won't find any cycling/swimming/stepping/obscure sports recording here, buddy. Sleep tracking is an interesting exercise. The band should fire up the time screen at the flick of a wrist, but I found this to be hugely arbitrary. Often it seems to respond like an Apple Watch – that is, like it's supposed to – but sometimes it blurts the time at you for no reason. Or you'll be waving your arm frantically and all you get is a blank screen. This isn't so good when you want to sleep track and the screen starts shining like a persistent glowworm just because you've turned over in bed. The sleep tracker also delivered wildly different results across three nights, varying by over an hour in duration – despite me going to bed and getting up at exactly the same time. Plus, of course, you've got that incongruous Bluetooth headset, which works, to a degree. The set was robust and clear on my end, but not so much for the people on the other side. Scan a doohickey in the quick set-up booklet to immediately download the support fitness app for iOS and Android smartphones, then the setup's a simple step-by-step process to input your height/age/weight stats, offering metric and imperial inputs for old timers. All this tracks to the app, or can be synced to Apple's Health app, if you prefer to record your energy output that way. You set your daily calorie munching goal, which gives you an idea of what the kcals and steps equate to in terms of walking, running and cycling, and off you go. There's even an Apple Watch-like reminder to go walking if you've been sedentary. A stick man with a cane gives you a cheery wave alongside a cheeky wrist buzz. Plus, check in every once in a while and you get entertaining updates, such as telling you that you've burned the calorific equivalent of one strawberry. The TalkBand B2 is snug, light and unobtrusive to wear. Once you've strapped it on, you probably won't notice it. The Apple Health compatibility is a real boon and Huawei's bespoke app is informative and easy to use, if a bit sparse on features. But that Bluetooth headset is a curious addition. Bluetooth integration would be far better served delivering message notifications like most of its competitors, allowing the unit to be smaller, more svelte and, most importantly, cheaper. The list price of £169.99 ($180) is a big ask for a gadget so light on features, especially one with tracking accuracy issues.